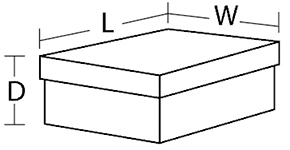 If you require a stock box you do not need to fill in the dimension sections. We can’t make rigid boxes, ours are die cut, and are sent out flat packed, ready to fold up. We can’t do full colour printing. The printing that we do is foil printing or hot foil stamping, usually one colour and one postion. More details on this type of printing are available on our website under “foil printing”. DO YOU WANT A CUSTOM BOX SIZE? Please note that you must order 250 min. for all custom boxes.